Originally published on Finding Todd. The following happened during my trip to Cambodia. My long awaited trip to see the temples at Angkor Wat was delayed a few days because of dehydration. I woke up this morning around 7am ahead of my 10am departure time to the temples. It quickly became apparent that that wasn’t going to happen today. I had major stomach cramps and I was really thirsty but afraid to drink because I felt I would just throw it up. So I let the tuk tuk guy know that today was a no-go and then I booked another night here in Siem Reap and contacted the hostels in my next two stops to let them know I’d be a day late in coming. By noon I was alone in the hostel room with air conditioning that wasn’t working properly writhing in pain on the bed. I couldn’t concentrate and I felt light headed so I just couldn’t rest which, obviously, is the best thing to do in cases like these. 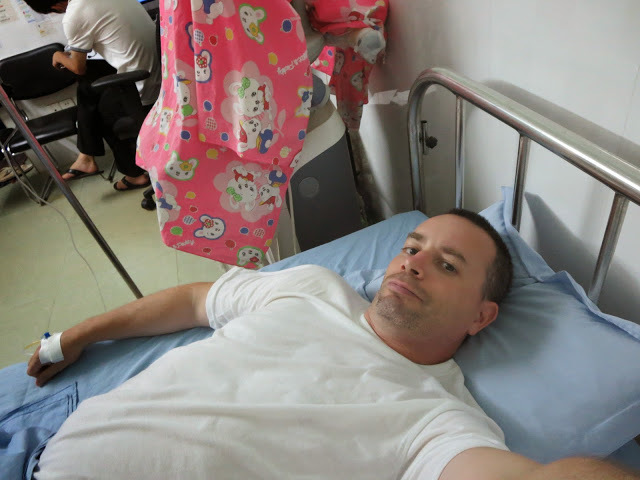 I figured it was dehydration and not food poisoning only because the experience was different from my bout of food poisoning I had last month in Vietnam. I finally decided to head downstairs and ask for some help. I wanted to go to a hospital or reasonable facsimile. Luckily, Gus, the Australian co-owner of the hostel was at the bar and immediately took me under his wing. He gave me a bottled water with a pack of electrolytes added to it and gave me advice on my different options. 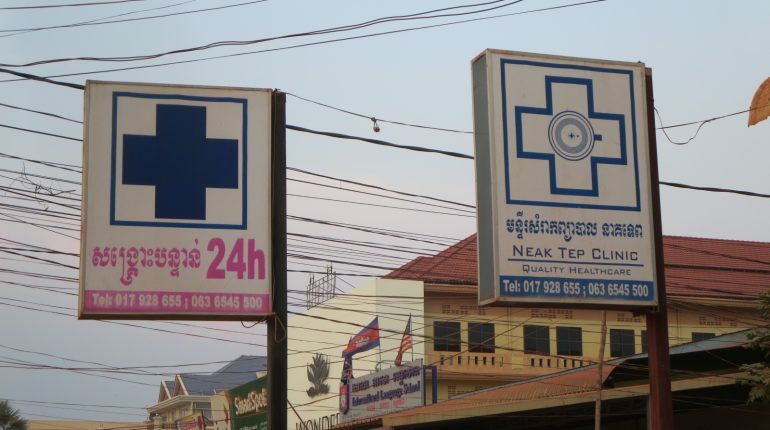 I opted for the Cambodian clinic a couple of kilometers away as it seemed my best option plus he said there was an Aussie girl working there too so I would be able to communicate with them. He organized for a tuk tuk to take me there. I sat slouched in the back of it enduring the bumpy dirt road to get there. The man had been given instructions to wait for me while I got checked out as we didn’t know if it would be a quick in and out, a few hours, or overnight. 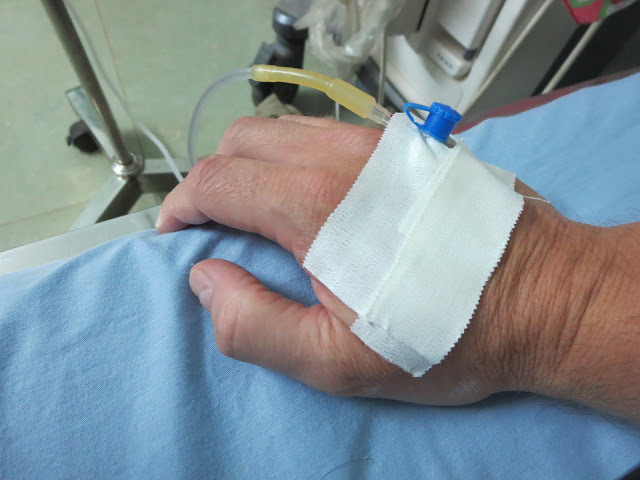 The doctor saw me almost right away and suggested an IV drip. Of course, unlike Canada, the cost was coming out of my pocket so I had to make sure it was a reasonable price. He said it would be around 50 dollars and would take about 5 hours. Seemed reasonable to me so I let the tuk tuk man go asking him to come back at 6pm and went back inside. I laid down on a bed in the doctor’s office and got hooked up. Here I spent the next 5 hours. Thankfully the office was fully air conditioned and I was the only one in there. Every so often I would drag the IV and its’ stand to the ensuite bathroom to, well, you know. As the afternoon wore on I was starting to feel remarkably better. I had energy again and wasn’t light headed. 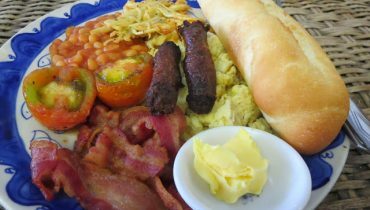 I still had stomach issues and wasn’t hungry at all but at least it was a vast improvement over this morning. Gus even came by to check on me which gets huge marks in my book. I already thought his hostel was awesome but that was just like the icing on the top. 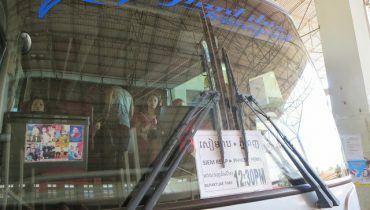 By the way, the hostel is Siem Reap hostel – stay there! 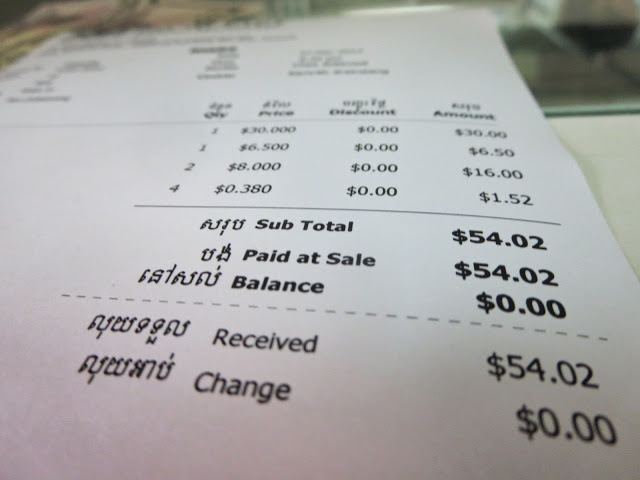 At 5:30 I was checked out, paid my $54 and waited for my tuk tuk driver to return. On the ride back, I quickly realized my thoughts of resuming my plans tomorrow weren’t realistic as I wasn’t feeling quite as good as I thought I was. The bumpy ride did really bad things to my sore tummy and I had now gone a full 24 hours since I had eaten anything. So, I changed my plans for Siem Reap yet again. I won’t be going to the temples tomorrow opting instead to just relax and recuperate. I will still leave for Phnom Penh the following day at noon. I’ll just go to the temples for the sunrise at 5am instead. Oh, and I’m pretty sure I’m not going to do the normal 6-7 hour tour of the temples and just go see the sunrise and then Angor Wat. Frankly the thought of walking around in 36C heat for that long of a time scares the crap out of me – even if I was 100%. I went back to my hostel room and stripped down and just laid in my bed. My time alone was short lived though as the other 5 people staying in my dorm all came in at the same time. Along with one other Canadian dude I was surrounded by beautiful UK women. Once again, hard to concentrate but this time it was a little better. By 7pm everyone left the room again and I was on my own again which suited me perfectly cause that’s pretty much what I need for the next day or so. Although I still had no appetite I figured I should get something to eat as not eating is obviously a very, very bad thing. 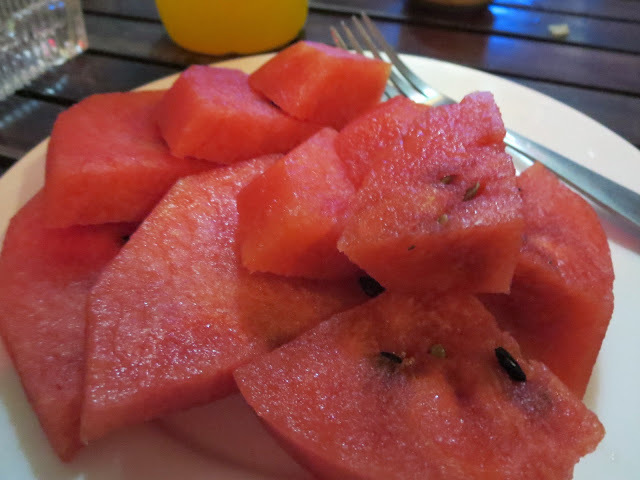 I went downstairs and ordered a fruit plate (all watermelon please) and a hot dog. I munched on the fruit but even had difficulty finishing that off. The hot dog I took away to hopefully eat later on in the night in the room. By 9pm I was in for the night watching TV shows I had downloaded in a room all to myself. As the day ended I was remarkably still in pretty good spirits considering how sideways the day went and how conflicted I was on my trip just a mere few days ago.